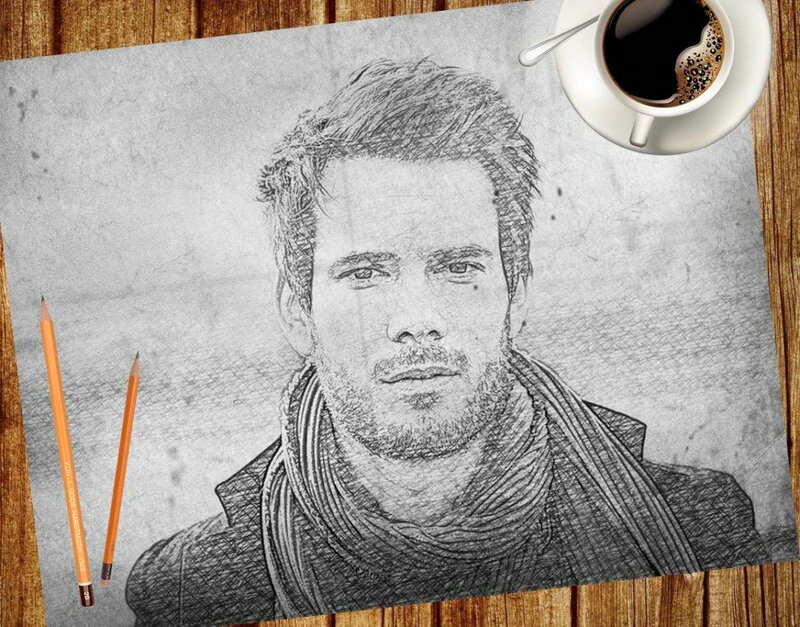 Learn how to create a realistic photo sketch in Photoshop using some simple filters; you cab create your own digital sketch drawing in just a few minutes. If you want an even faster method you can try my sketch Photoshop action; I hope you will enjoy this new tutorial and practice it on your own photos. 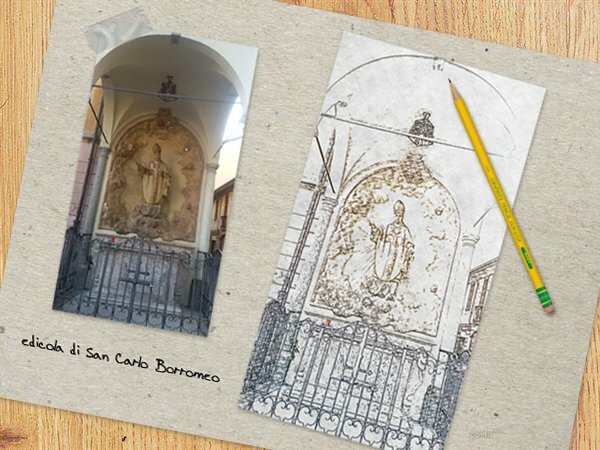 Let's take a quick look at the final result of the pencil sketch drawing Photoshop tutorial. This tutorial is for intermediate Photoshop users and it will take you abot 20 minute to make. I will start with a background image choosing this beautiful rough paper texture; you can also use another old paper texture from this list. You have to desaturate the paper texture. Time to add the photo. I will use this beautiful girl stock image but you can use whatever image you like but you might have to make small adjustments. Set the Foreground color balck and Background Color white. Duplicate the Girl Layer three times so in total you have to have 4 girl layers. Select the Girl 2 Layer and Go to Filter>Sketch and choose Stamp. Select the Girl 3 Layer and use the same Stamp Filter but with different settings. Return to the Girl 2 Layer, open the layer style window and hide the white color. Right click on the Girl 2 Layer and choose Convert to Smart Object; read more about Smart Objects in Photoshop. Reapeat this process with the Girl 3 Layer. I will now use a simple pencil sketch pattern that I have made and add it as Pattern Overlay for the Girl 2 Layer. This is not a seamless pattern as you can see but we'll fix it in the next steps. Download the sketch pattern or create one yourself. Do the same thisng for the Girl 3 Layer but resize the pattern a little bit and also drag the pattern to obtain a non repetitive result. 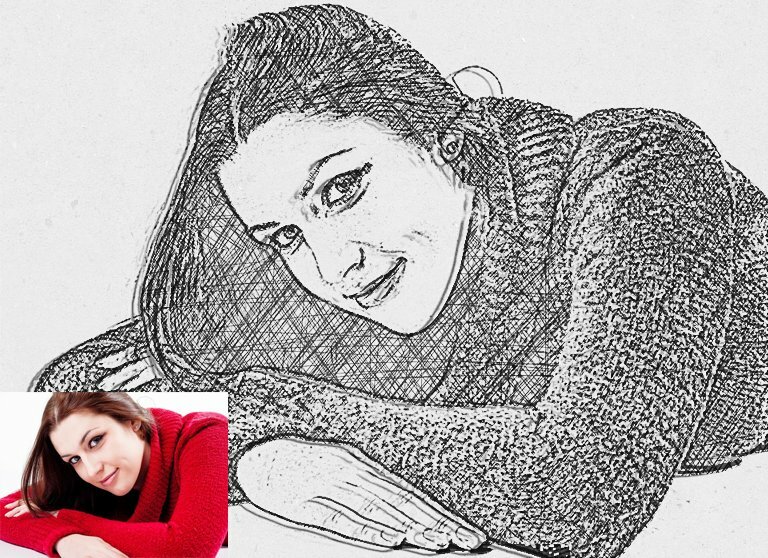 Select the Girl 4 Layer and Go to Filter>Sketch and choose Photocopy. Place the Girl 1 Layer above all the other layers and change its blend mode to Screen. Also add a Hue/Saturation and Brightness/Contrast adjustment layers only to this layer. As a final touch use a copy of the Rough Paper Texture and place it above all the other layers. Desaturate the texture and change its blend mode to Multiply. You can adjust the pencil pressure and color intensity by adding a Brightness/Contrast adjustment for all the layers. 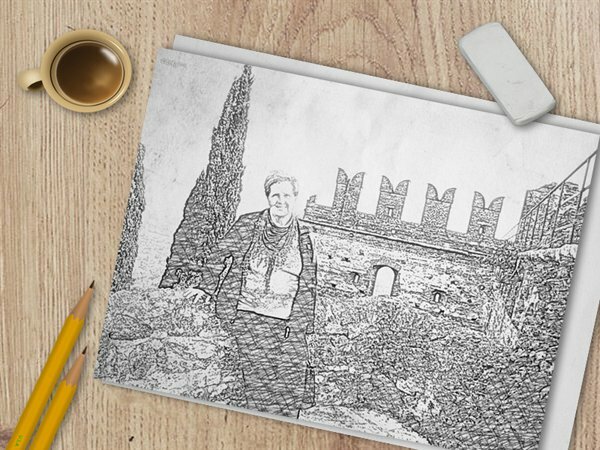 So here is the final result for our sketch drawing Photoshop effect that you can make in just a few simple steps using a premade pencil sketch pattern. If you want you can use some pencil brushes instead of the sketch pattern. Or you can use both for a better result. 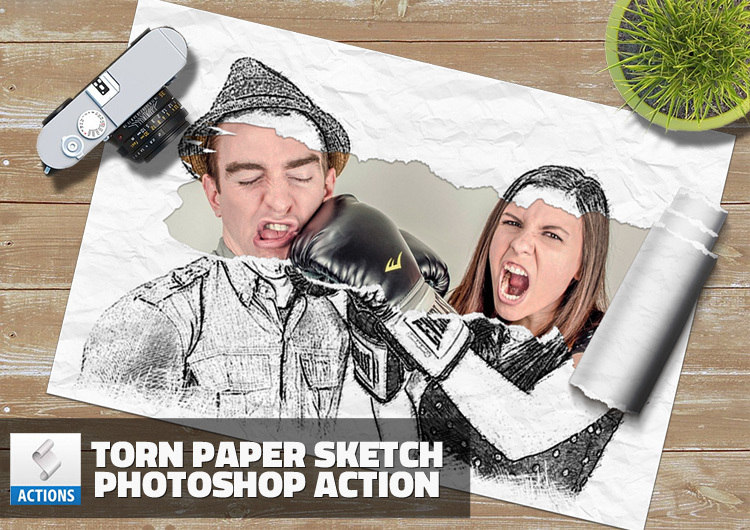 These sketch Photoshop brushes are used also in creating different sketch and pencil drawing photo effects. Here are some useful actions for creating pencil drawing sketch effects in Photoshop in under a minute. 12 comment(s) for "Create a Pencil Photo Sketch in Photoshop"
i had a different result..
when i applied the sketch pattern to the layers..
the picture became black colored..
maybe i did sth wrong..or...i missed sth ..